Finding neat little card games is always a thrill. Such games are generally lower cost for gamers to acquire. They store in the smaller nooks and crannies of your game room. They are easily popped in a pocket, purse or satchel to take to a buds’ place for a night of gaming. Overall they just hit a lot of positive check marks in terms of making them desired games. 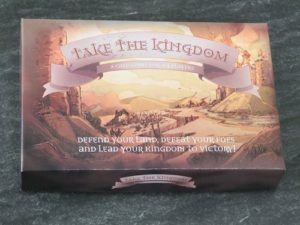 Which brings me to Take The Kingdom the first game from Walnut Games, and designer Ian Walton. The game is stated to be suitable for two-four players and taking around 30 minutes to play, but I will add my own caveat, that it is far better if left as a head-to-head, two-player game. This one is about building your own defenses while attacking the kingdoms of other players. As might be expected, unless perhaps played as a two-on-two team game, you will find the perceived weakest player piled on pretty quickly, which is rarely a fun experience for that player. That does not mean this game should be overlooked, just be aware there are some limitations in games with more than two players. I might suggest making sure in multi-player games that the sharing of resources be allowed. In olden times alliances came and went on a whim. One day you might send archers to help a neighbouring ally, the next side with his enemy. It would add some spice to the game played with three, or four. The game is easy to learn. You start with a fort and some land, and during the game, you hope to add walls, moats, archers and knights to fortify your kingdom. 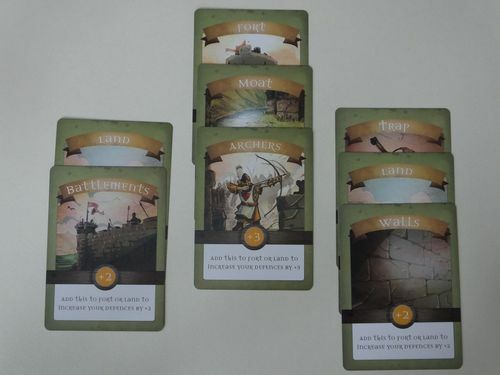 The building of defenses must be balanced with efforts to attack the kingdoms of your opponents with siege towers, soldiers, trebuchets and similarly themed cards. Players can also use action cards to influence play. Designer Ian Walton said creating the game was a new experience for him. 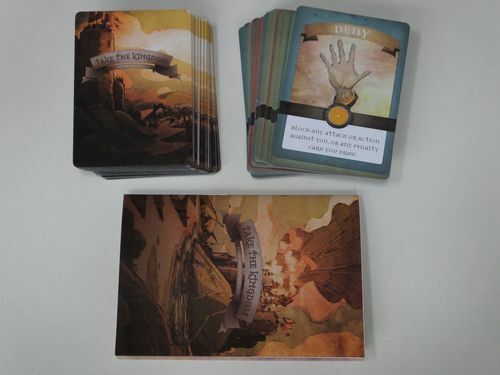 “This was our first published game so from my point of view very much a learning experience, but from reviews and informal feedback from players so far, I’ve been very pleased with how it’s gone,” he told me via email. 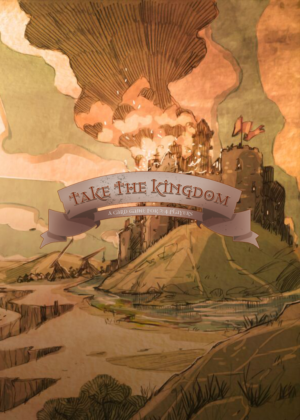 Of course, there were some challenges in creating Take The Kingdom. 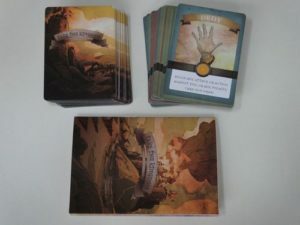 “The most difficult part of the design was keeping it simple – it’s so tempting to add another dynamic, another set of rules, but I always wanted this to be a simple game that felt like it had depth, and where the gameplay comes from people’s own tactics, not complex rules,” said Walton. “I want people to pick this up and know they can quickly play it but still feel like this isn’t Snap or Uno. Interesting the designer sees the game’s strength differently than I did in playing it. Asked what he likes most about the game, Walton pointed to its look. “I love the artwork – Luke (Horsman), captured exactly what was in my head without me needing to spell out the detail. I hope this makes it more atmospheric than you would usually get from a card game. The art is indeed nice, fitting a lighter-themed game well. The box was less an issue in my books. 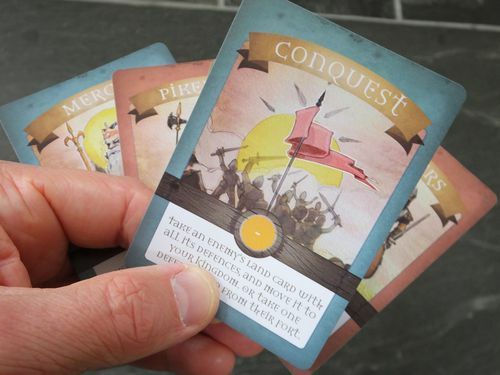 The rulebook could use a few more examples of card play. The biggest issue was some miss-cut cards, but again one appreciates small run games can face such issues. So what may be next for Walton?